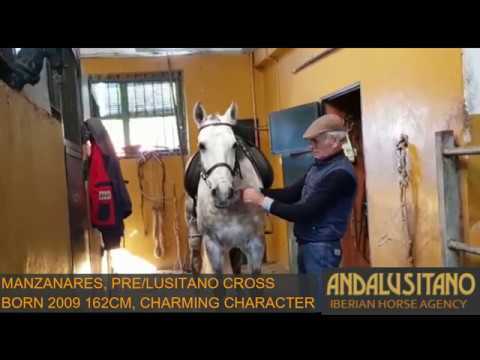 Manzanares is a Lusitano/PRE cross gelding with a very friendly character! Due to his cross breeding he has a very strong hind and seems very sound and healthy. Born in 2009, this handsome gelding is 162 cm and has medium/advanced schooling. He also does a pirouette and a flying change. This gorgeous boy is very easy to handle in the stable and in all other aspects. He absolutely loves being fussed and cuddled! This amazing horse is not phased by much, he is adaptable to different riders! You could ride him through town and he would not be bothered by traffic, or crowds! He would make the most loyal friend and companion. He would be absolutely perfect for ladies and novice riders due to his very gentle nature!